Happy Tuesday and time for another new Cue Card at CASology! Super sweet Tracey!!!! Love your clouds and sky!!!! Fabulous idea for a basket. You know I always love to see those hot air balloons, and your embossed and smudged clouds are the best--so realistic looking. Fabulous CAS card, Tracy! Your designs are always fantastic! Oh! This card is sooo very sweet. I love your clouds!! Fabulous card, Tracey! I love your clouds so much! I didn't even realize there was a 'smudge'...I think it looks the same as it does in nature, and I love all the texture from the paste! Beautiful coloring on your balloon, too! Bravo to you for making your own clouds and they look super! This is cute Tracey, love that balloon! Gorgeous! LOVING the balloon and the clouds!!!! Wonderful created scene! Great card! LOL! No, embossing paste doesn't have to be perfect. In fact, that's what I love about it! It always looks good, no matter what. I love it here as flowers for your hot air balloon. Great design! Agreed, the extra embossing paste resembles real clouds in layers...LOVE that! Love the blue card base, too...such a pretty background to your card! Yup! Great minds certainly think alike! :D Love the shading on your balloon and your clouds rock! Real clouds don't often have perfectly defined edges anyway do they? They're wispy and fluffy which you've captured perfectly! Love those clouds, Tracey! They look as though they are floating! And your balloon for 'basket' is brilliant! Love your CAS card! love those clouds.. cute card. Awesome--love the embossed clouds--just perfect! And the balloon colors are wonderful! Oh wow, Tracey, I just love the embossing paste clouds that you made, smudge and all! I like how they're close to your balloon too and not spread apart ... so nicely CAS! Gorgeous card. Oh so perfectly sweet, love love adore those textured clouds! What a great CAS design Tracey and I love the textured clouds - such a great idea! I think are clouds are perfect. Love your card. What a great way to use the paste for the clouds! This is fabulous Tracey!! 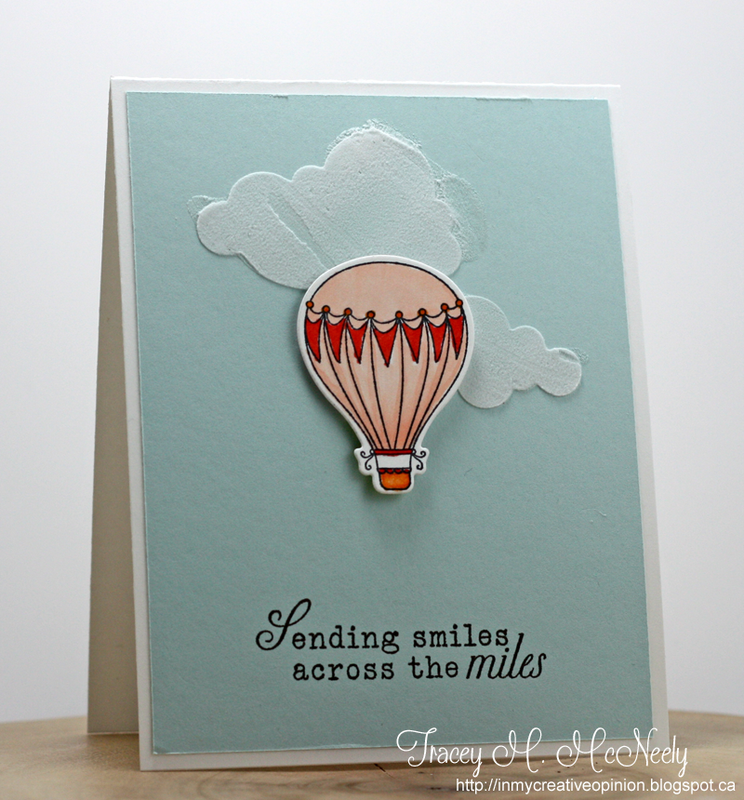 I love your embossing paste clouds and a hot air balloon basket is so perfect!! I totally agree with what you said! Embossing paster doesn't need to be perfect! Great try using paste on your CAS card! I'll give it a shot some day. Thanks for the inspiration, Tracey! Tracey, I love how you have created those clouds, and I actually think that the smudging gives a sense of movement and freedom - you want a big of wind up in that sky!! Such a lovely card! I think your clouds are fabulous, and that balloon...oh my! I want to 'fly away' right now! 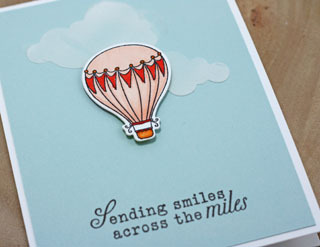 Love your clouds...so soft and fluffy looking and they look so fabulous with your amazing hot air balloon...fabulous card.